Calendar: «Day of the Holy Trinity. Pentecost». «There is always more of God than we know» illustrated quotation. Holy Trinity, free quote pictures for Facebook, Twitter, LinkedIn, Reddit, Pinterest and other social networks. Father, Son, and Holy Spirit remind us that there is always more of God than we know, always more of God than we can explain, always more of God than we can show. 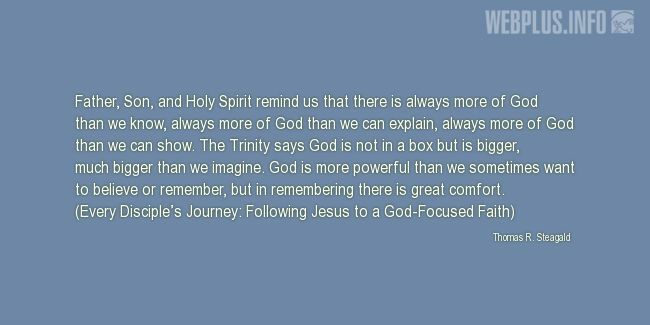 The Trinity says God is not in a box but is bigger, much bigger than we imagine. God is more powerful than we sometimes want to believe or remember, but in remembering there is great comfort.